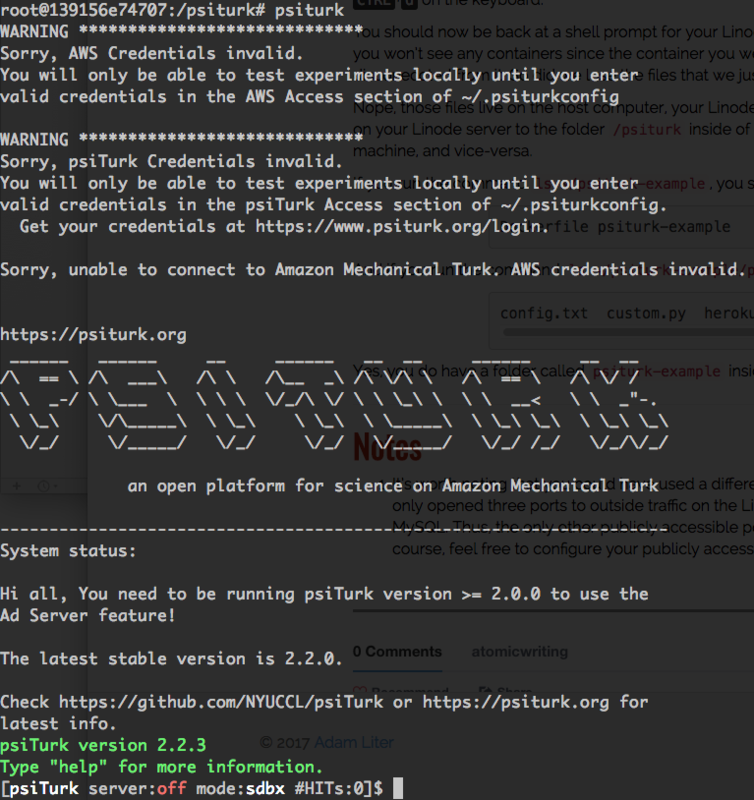 This is the fourth and final post in a series of blog posts about how to run an experiment with Amazon Mechanical Turk, using psiTurk. This post will cover how to set up a MySQL container and how to hook it up to talk to the psiTUrk container, using Docker Compose. Luckily, setting up the Docker container for MySQL container is very straightforward. You don’t have to do anything! There are a variety of official Docker images that are publicly available on DockerHub, and MySQL has such an official publicly available image. All that you have to do is configure the MySQL usernames and passwords, which we will do in a file called docker-compose.yml. As the name of the file suggests, this is where we begin to start using Docker Compose. This is a file that uses the YAML markup to give Docker Compose some information to work with. Specifically, it tells Docker Compose to run two services, one called db, and one called psiturk-example (you can name these whatever you want). Let’s start with the db service. The information for the db service in the YAML file says to use the latest mysql image as the base image for the Docker container. Next, it says to mount the directory /data/db from your current directory to the volume /var/lib/mysql inside the Docker container. /var/lib/mysql is where MySQL usually stores its data, so this means that the data written to MySQL will be mirrored inside the folder ~/psiturk-example/data/db on your Linode server (assuming that you run Docker Compose from the directory ~/psiturk-example). Next, let’s take a look at the psiturk-example service. First, rather than specifying an image, we tell Docker Compose to build the base image for the psiturk-example container from any Dockerfile that it finds in the current directry (i.e., .). Thus, we will want to put this file in the same directory as the Dockerfile that we created in the previous post. If you were following the instructions exactly from the last post, this means that you will want to create the docker-compose.yml file in the folder ~/psiturk-example on your Linode server. The Docker Compose file next sets up a link to the db service so that the psiturk-example container can talk to the MySQL database. We will come back to this below, because we will need to modify the config.txt file in psiTurk so that it uses this database. But let’s first finish exploring the docker-compose.yml file. Next, Docker Compose is instructed to publish the 22362 port of the container to the 22362 port of the host computer (i.e., your Linode server), just like we did in the previous post, except that here, we’re specifying this in a file, rather than on the command line. Moreover, just as we published the port in the previous post, we also want to map the folder ~/psiturk-example/psiturk-example on the host computer to the /psiturk folder inside of the container. This is done in the next line of the docker-compose.yml file. Likewise, we want to ensure that a pseudo-TTY is allocated inside the container and that the STDIN pipe is kept open, which are the next two lines in the docker-compose.yml file. And, finally, Docker Compose is also instructed to restart this container if it is accidentally stopped for any reason. The db:3306 part refers to the db service that Docker Compose runs, and 3306 is the default port for MySQL. Again, make sure that your docker-compose.yml file is in the same directory as your Dockerfile, since Docker Compose will try to build the psiturk-example service from the Dockerfile in the current directory. Specifically, if you’ve been following along, both of these files should be in the directory ~/psiturk-example. So, make sure you’re in that directory by running cd ~/psiturk-example. Then, you can start all of the services that are specified in the docker-compose.yml file by running docker-compose up -d. The up command creates and starts containers, and the -d flag runs them in the background. You can see which containers are being run by Docker Compose, with the docker-compose ps command, and you can stop all services being run with the docker-compose stop command. In general, you can run docker-compose --help to see more information about the available commands. Once you’ve started your two services with docker-compose, you can attach to the psiTurk container in order to start the experiment. docker-compose will automatically name the containers for the services that have been started based on the directory name. It will most likely name the psiTurk container something like psiturkexample_psiturk-example_1, for example. It might appear as if the command is hanging and not doing anything; however, this is not the case (see here for an explanation). Just hit ENTER a second time after running the docker attach command in order to get to the shell prompt of the psiTurk container.